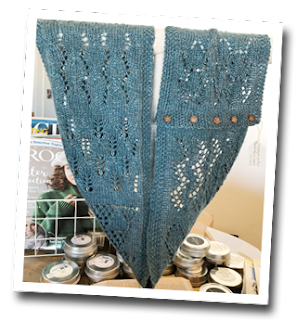 Join Sherrie on Wednesdays and Fridays (10:30am - noon) to knit "Myrkwood". This beautiful scarf/cowl is a lace sampler that is as fun to knit as it is to wear. You will get a chance to practice several different stitch patterns and hone your chart-reading skills. Needles: sizes 4 and 6. Kitty invites you to join her in knitting the amazing Riley Shoulder Warmer on Tuesdays and Thursdays (10:30am - noon). The subtle gradation and textured stitch pattern make this a soothing and cozy knit that you are sure to enjoy. Needles: sizes 4 and 5. Please be reminded that in order to participate in the KAL, yarn for the project must be purchased at Yarn Nook. As always, patterns and yarns for the KAL are 10% off.